Right now, many traders are seeing the big upward price swings in the metals as a sign that prices will continue higher. Well, in the long run, they are correct. But right now I believe the metals will roll over and trend lower for the next few weeks setting up for the next leg higher. 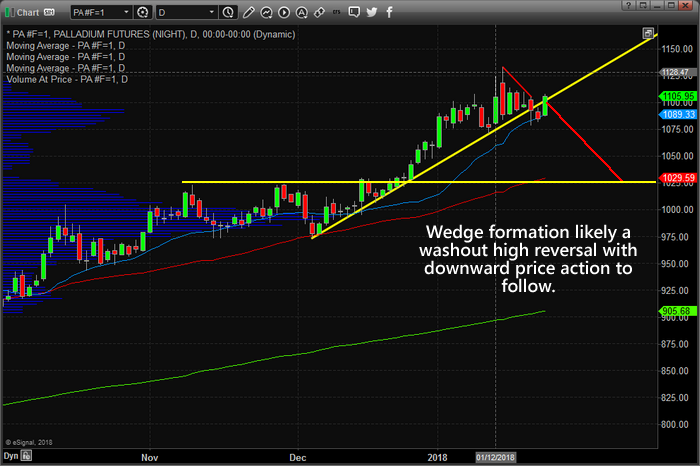 Palladium is a perfect example of this Rollover expectation. Both the current and long-term monthly chart shows signs of a massive double top, and the daily chart WEDGE/Pennant formation is likely a washout high rotation pattern that will prompt lower prices over the next few days/weeks. This monthly chart to us is nothing more than a reason for the overbought Palladium market to have a minor pullback before potentially running to new highs. We could see a couple weeks or potentially a few months of weaker prices, but the point here is that price is overbought and at resistance on the long-term chart and imminent pullback is likely to occur for a tradable short or to re-enter after the price has corrected and shows signs of strength for another run higher. As you can see from this chart, we are expecting a rotation lower based on our modeling systems predictive capabilities that will result in a substantially lower price swing – possibly as much as -8 to -10%. We believe support will be found just above the $1000 price level. Additionally, our Adaptive Dynamic Learning (ADL) modeling system is designed to scan historical price activity of any chart and find the unique price and technical indicator formations that operate as DNA markers for the price.It then continues to scan for new or repeating DNA markers in the market to determine probable outcomes of the price going forward. In this case, the ADL system is predicting a lower price swing to near $1020 near or after February 8th. After this price contraction, the ADL system is expecting a solid rally to form. Where Next For Gold After Such A Bright Start?